I would like to see a Data Matrix Reader. I currently use a Quartz Composer plugin created by Dieter Wimberger who graciously made his source code publicly available under a BSD style license. There may even be interest in other types of barcodes and perhaps QR codes being read as well at some point. For the proposed node, we'd plan to use zxing, which supports DataMatrix, QR Codes, UPC, Code 128, and several other barcode formats. The node can detect multiple barcodes in a single image — it outputs a list of text items, or an empty list if no barcodes were found. Chris, Thank you for the feature request. Let's do this! We'd be excited to see a barcode reader node happen and Steve is kicking it off by pledging half the credits. 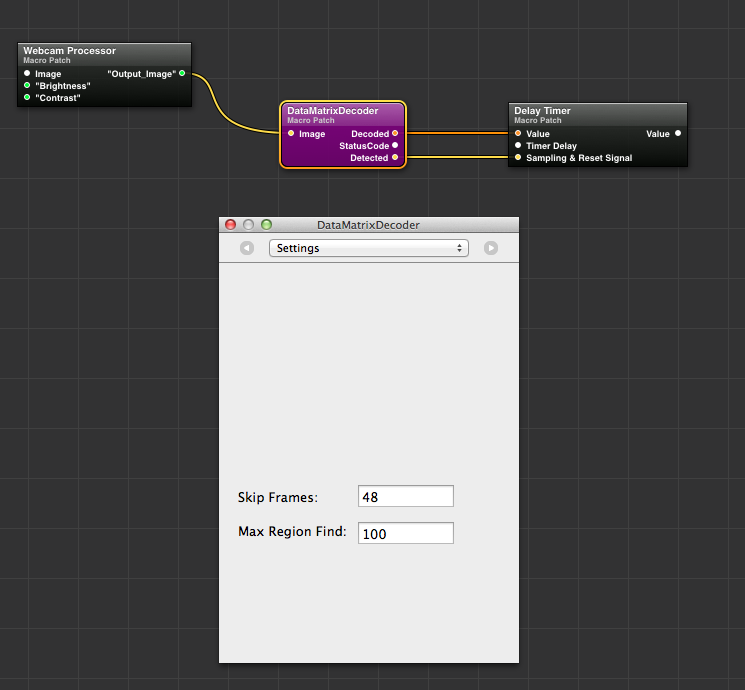 The node sounds great, can the output an "empty list" have a toggle to be turned off? For instance if you want to hold the last barcode read until a new one is detected, or would that best be done with a hold and release type of node? Thanks Chris! We're excited to see your idea come to fruition and will be getting started on this soon. We'll look over your question about the "empty list" and get back to you. This is how the Datamatrix Decoder I currently use works under Quartz Composer. I liked it because I was able to lower the framerate of the reader with the Skip Frames feature which reduced the processing power required for the patch. Also the "Detected" trigger lets the "nodes" down the line know when a new code has been detected so that they can grab the new decoded string (text). I know VUO works differently than QC, and I understand much more efficiently, but a VUO node that has a sampling rate and a "Detected" feature would be beneficial I think. @cwilms-loyalist, we've scheduled this for release 0.8, due out mid-to-late May. We've discussed the "empty list" issue you brought up, and we'll have a node ready to handle that situation. Thanks again. Hello, sorry a little off topic but I would like to ask CWILMS-LOYALIST how he makes Quartz Composer's Datamatrix Reader working ? I discovered this patch 2 days ago, but I didn't obtain any result (see the screen capture). PS : and of course, I'm happy to see this tool arriving in Vuo ! I just tried the new barcode reader on some of my datamatrix codes using the existing barcode demo included with 0.8 with a slight modification to add a syphon camera feed. It read my codes! Thank-you! :) I'll have more time to play with this shortly, I am very excited to see if it can do everything I need it to. I'm having an issue with the Find Barcode in Image node crashing the Vuo Composition Loader when it detects a barcode. I'm running the example patch findBarcodeinSyphonImage.vuo. The crash occurs a moment after the barcode is recognized (I'm using a PDF417 barcode). I attached a stack trace here. It looks like the problem is : "Application Specific Information: terminating with uncaught exception of type zxing::ReedSolomonException: Euclidean algorithm already terminated? abort() called". gabe, thanks for posting a bug report. I followed up there.